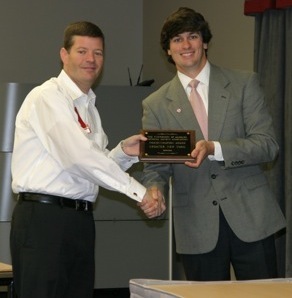 The chapter received two awards at the 2011 Alumni Weekend Luncheon. TUSCALOOSA, Ala. -- The Greater New York Chapter was honored with two awards from the University's National Alumni Association during its annual Alumni Weekend Luncheon surrounding the 2011 A-Day festivities. For the second-straight year, the chapter received the Scholarship Leaders Club Award, given to chapters that award $5,000 or more in scholarships a year. The chapter also received the Outstanding Communication Award, given to the chapter that, through a variety of ways, most effectively communicates with Alabama alumni and supporters in its area, including having an updated, informative website and utilizing multiple resources for communication, including newsletters, email marketing, local media and social networking. UANYC Vice President, New York Corey Gibbs was on hand in Tuscaloosa to accept the awards on behalf of the chapter.